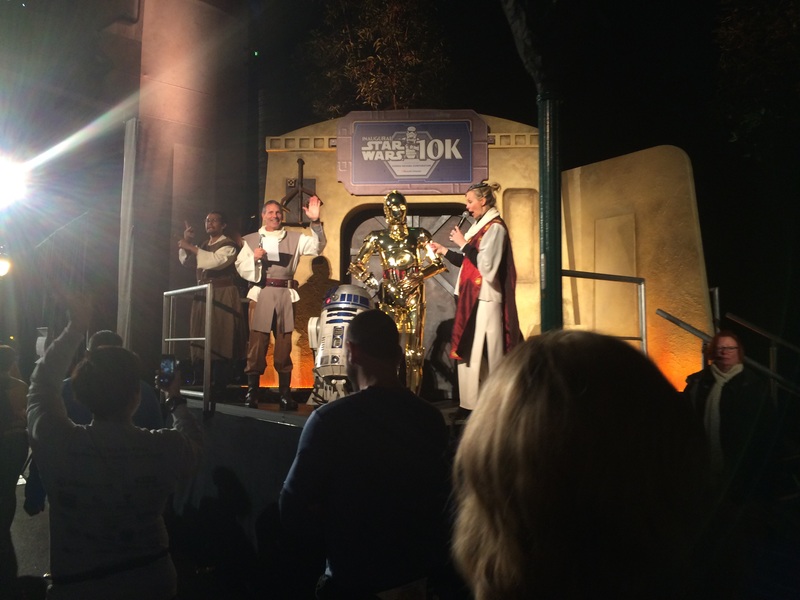 The Inaugural Star Wars Rebel Challenge Begins with a runDisney 10K PR! 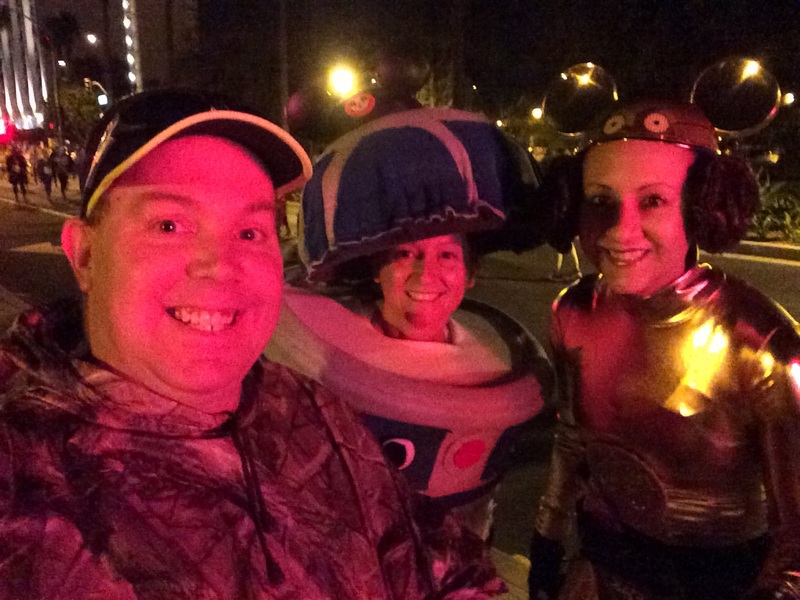 When I signed up for the Inaugural Star Wars Rebel Challenge, the plan was to run the Star Wars 10K with my wife and the Star Wars Half Marathon by myself. 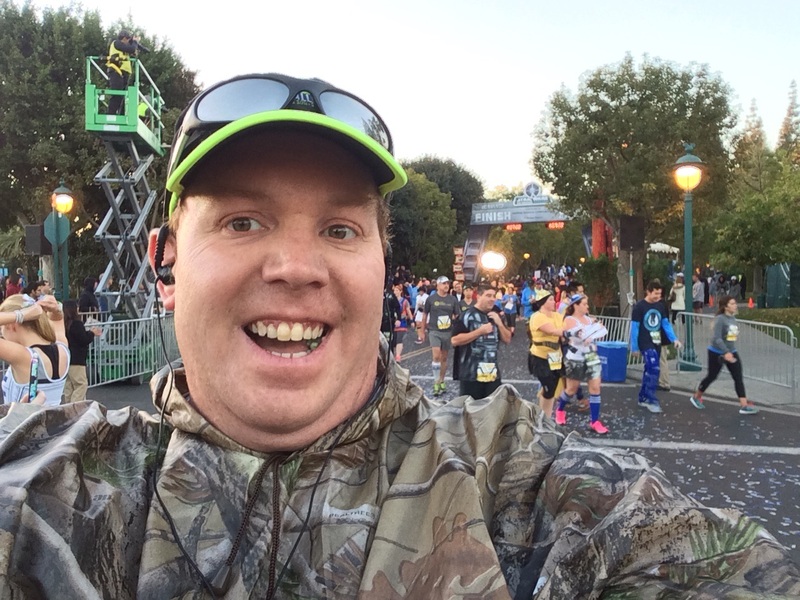 All of the challenge races I’ve run at Disneyland worked out this way. My wife runs a little slower than I do. So, when I run with her, I’m not exerting as much energy. This works out perfect because it allows me to take lots of pictures on the race course, have fun , and save energy for the half marathon. Well, the plan changed when, just as we were heading to bed, my wife got sick. I’ll spare you the details. Let’s just say that she was up all night long. I felt so bad for her that I didn’t exactly sleep much either. However, she really wanted me to run. 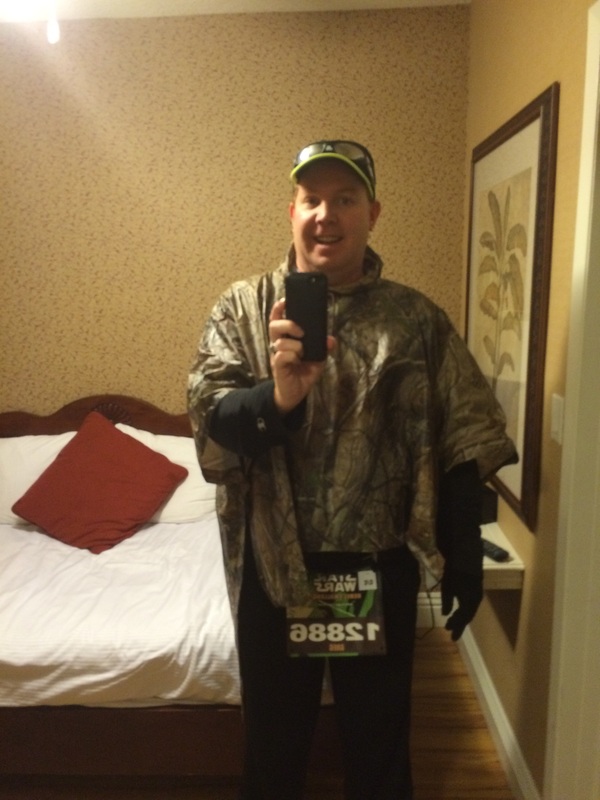 So, at 3:15am, I was up and started getting ready to run a 10K without her. It was the strangest time of getting ready for a race that I’ve had. Without Brooke, I had to decide how I was going to run this 10K. Do I go for a new 10K PR? Or, do I just go out and enjoy? Decisions. 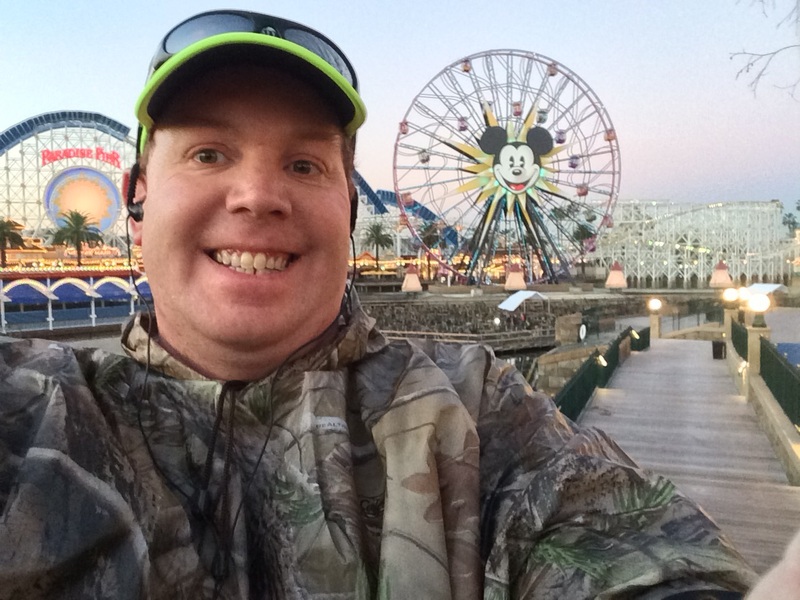 I made it out for the Team #runDisney Facebook group meet up. Some of these folks were fresh off their Dopey Challenge adventure from the weekend before. After chatting and getting this photo, we wished each other luck and headed to the corrals. On the way to the corrals, I noticed some runners heading into the Paradise Pier Hotel (presumably to use their restrooms). I thought this was a great idea and did the same. Plus, it was a little warmer inside! Even though I knew I wouldn’t have any trouble with being swept off the course for the 10K, it’s always nice to know you won’t have to wait as long to start the race. As I waited for the race to start in my corral, I saw these two ladies pass by and called out to them to say hello. 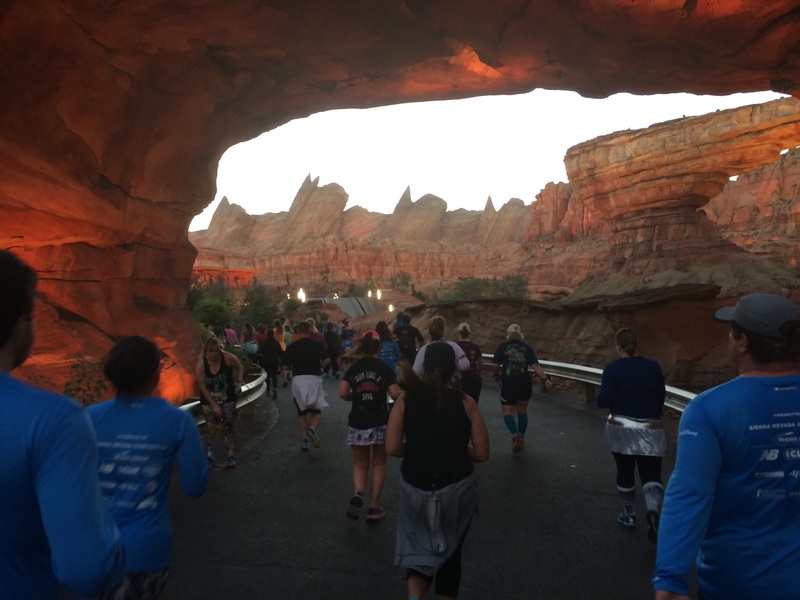 If you’re connected to the runDisney community, you probably know them already. Gail and Kim run all the races and always have the best running costumes. For the Star Wars races they were a tie-fighter and x-wing fighter for the 5K, R2-D2 and C-3PO for the 10K and Tinker Bell Storm Troopers for the half marathon (even though I never asked, I’m pretty sure it was paying homage to the fact that the Tinker Bell Half Marathon Weekend previously occupied this weekend). 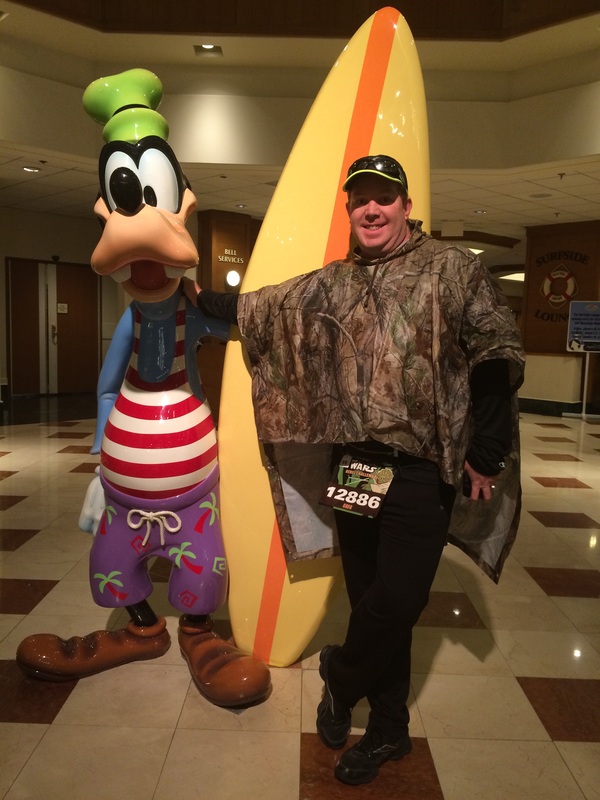 If you haven’t been able to meet Kim and Gail yet, look for them at your next runDisney event. They are super awesome people. 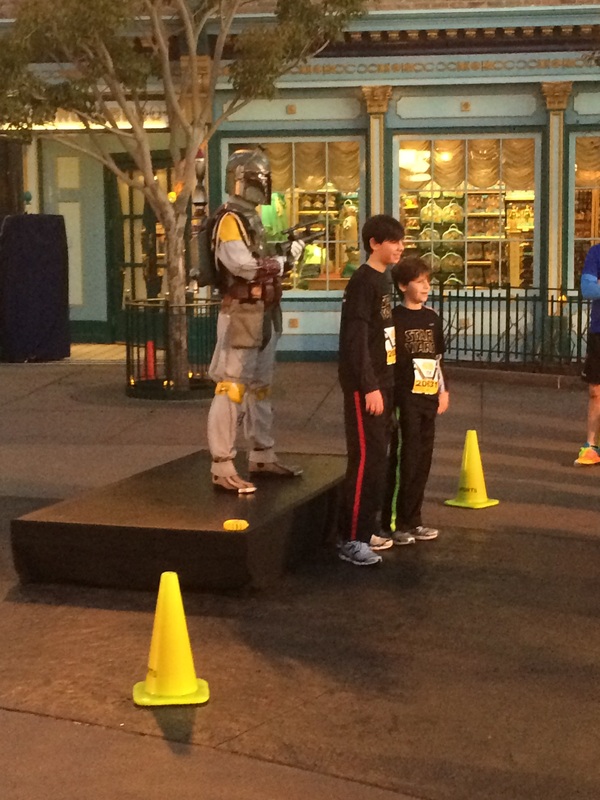 The pre-race banter was pretty fun with it being very Star Wars themed. Rudy got temporarily captured by the Dark Side of the force and had to be rescued. Don’t worry, before the race started, all was right again. Once we found Rudy, the race got started and Corral C began moving towards the front for our start. Look! 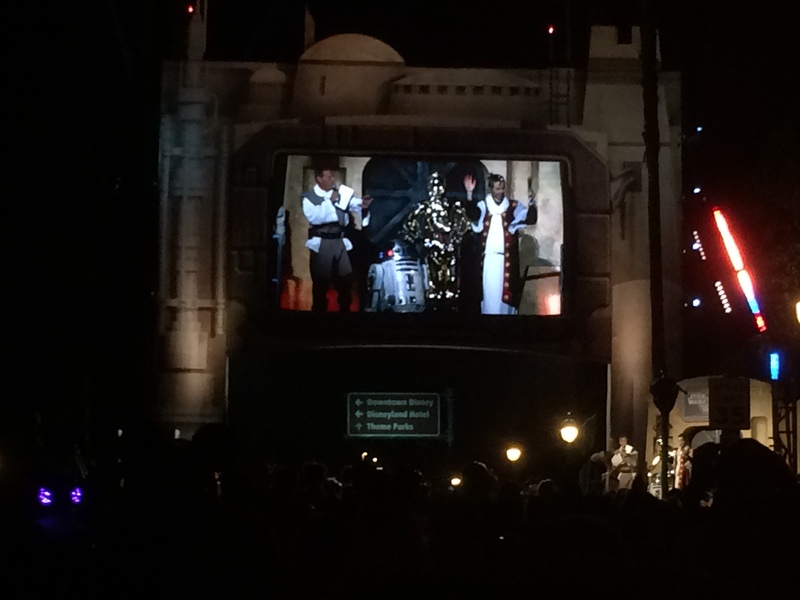 R2-D2 and C-3PO were also there to send us off! At this point, I was still trying to figure out how fast I wanted to run this 10K. Not exactly the best way to start a race. Before I knew it, it was our turn to RUN! Hello and Good Bye to our fabulous race announcers! See you at the finish line! When I crossed the start line, I had a little glitch with starting the Nike Plus App on my phone. So, I was a few seconds off at the beginning. The plan I decided to try out first was to just my intervals…run 30 seconds/ walk 1 minute and see how it felt. The first mile featured two overpasses. What a great idea! Put the most difficult climbs at the very beginning when we have all our energy! Neither overpass really hurt me much. I finished the first mile in 12 minutes, 22 seconds or so. It was a little slow for what I’ve been doing. However, with all the weaving you have to do at the start of a race, I was fine with it. Plus, I felt pretty good. 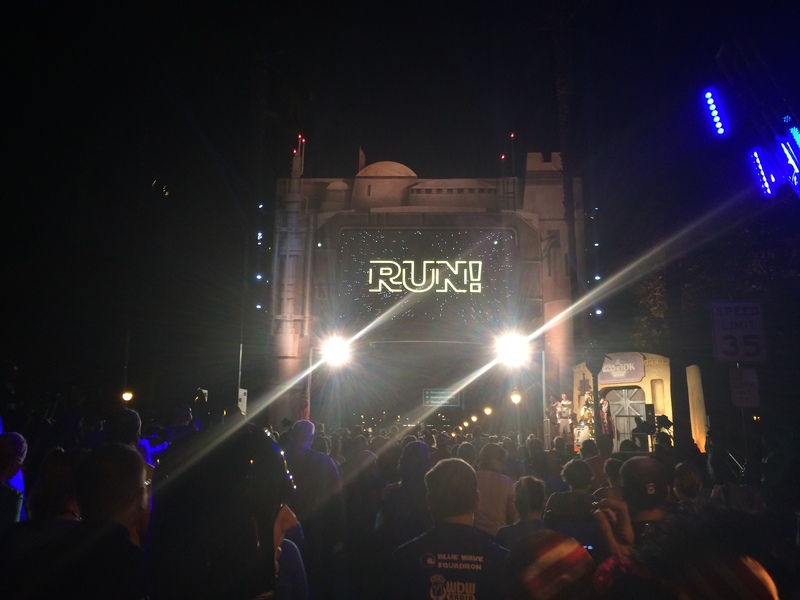 In the first half mile of 2 we faced the dreaded tunnel that runs between backstage Disneyland and backstage Disney California Adventure. 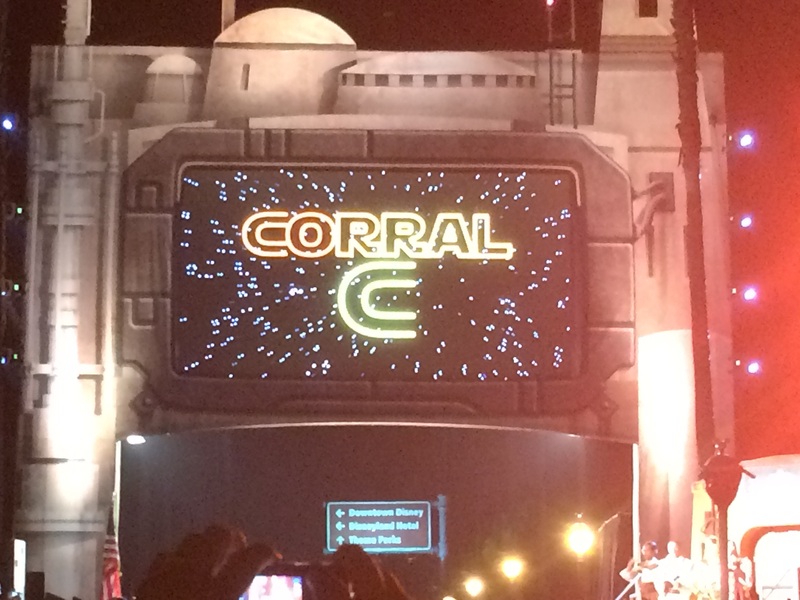 Here’s where we got treated to something pretty cool. They had the sounds of Darth Vader playing as we ran through the tunnel. A lot of the people by me were commenting on how cool that was! They also had some fun lights going on in the tunnel. I think it made for a great distraction for our last climb of the entire race. I ran up the entire way! All I thought to myself as I ran up the other side was that this was the last climb of the race. 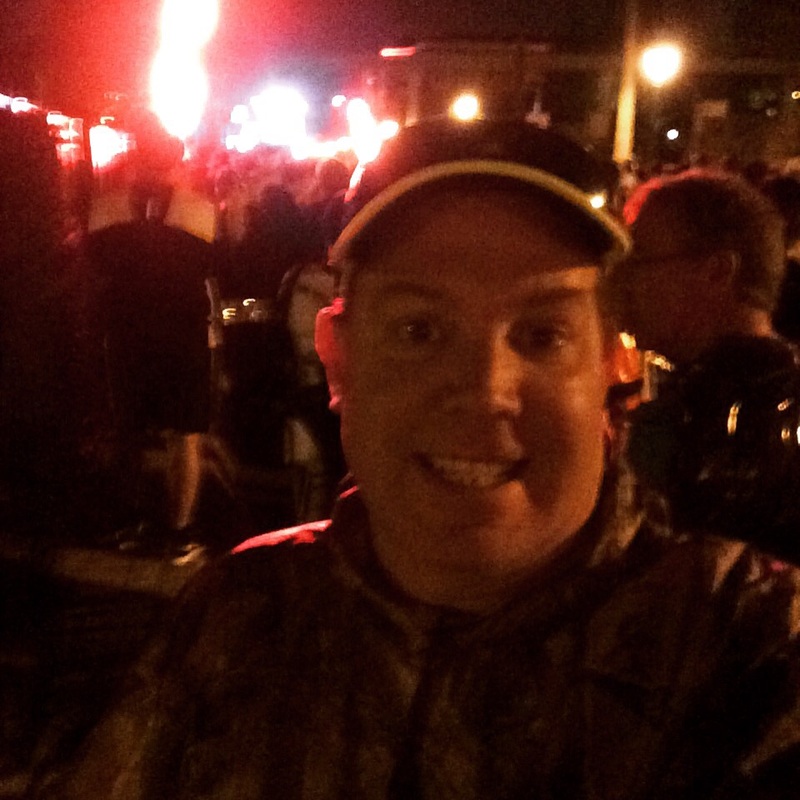 I wanted to be able to say I ran the entire thing! It was a quick trip backstage at DCA before we were headed across the Esplanade and into Disneyland! I knew the mile 2 marker was at the end of Main Street U.S.A. and I was attempting to make up some time. I love the mile markers on this course! Since I was still trying to see how fast I could finish this 10K at this point, I only had time for a quick picture. According to my Nike Plus stats, I ran the 2nd mile in 12 minutes, 15 seconds! I was a little over a 12 minute per mile pace but was feeling great! I didn’t stress too much because I knew the climbing was behind me and there was still 4 miles to make up time. We turned towards Frontierland as we started mile 3. 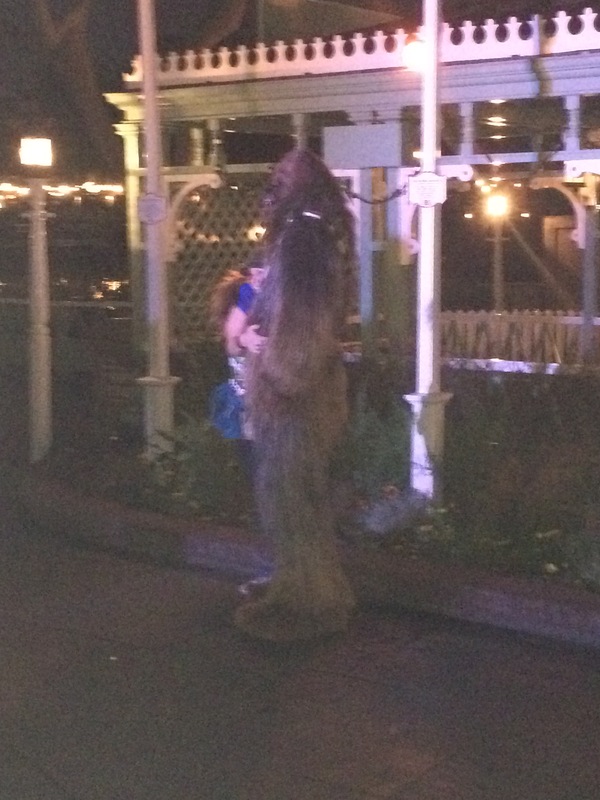 By the Rivers of America, we came to the first character on the race course….Chewbacca! The line went on forever. That kind of bummed me out. I would have loved to stop. But, I was still trying to get a great time. So, I stopped and grabbed this picture instead. 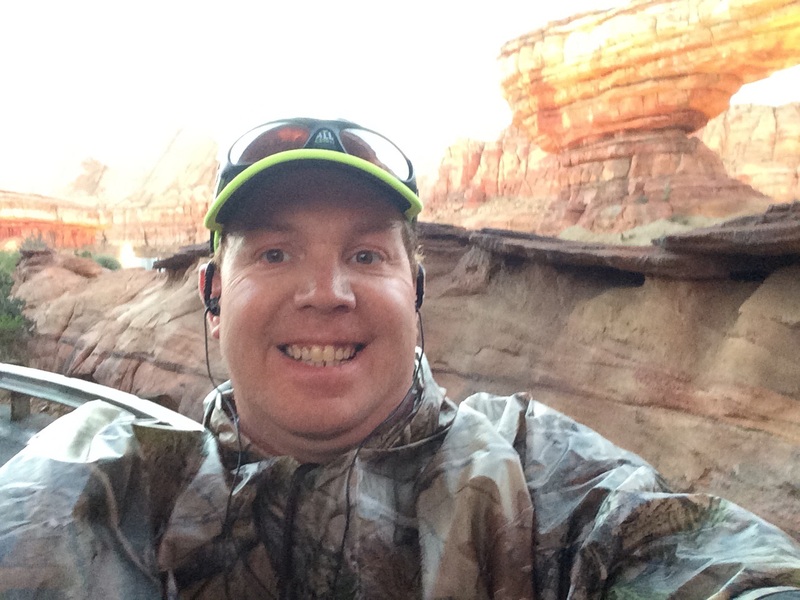 We wrapped our way around the Big Thunder Mountain Trail to Fantasyland. 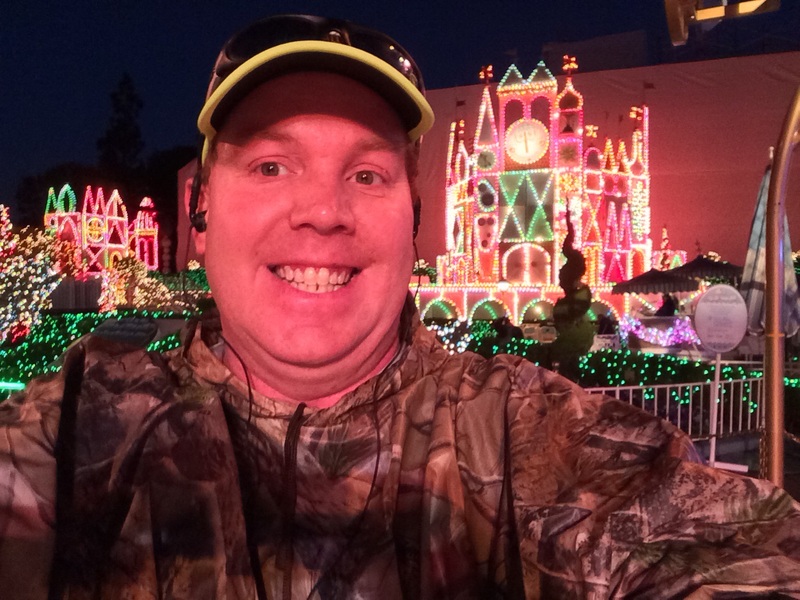 Unlike many previous runDisney races at Disneyland, we did not turn up and run through Sleeping Beauty’s Castle. Instead, we continued past the Tea Cups, turned to the right and headed towards Main Street U.S.A. on the parade route. Once we got to Main Street U.S.A., we turned towards Tomorrowland. 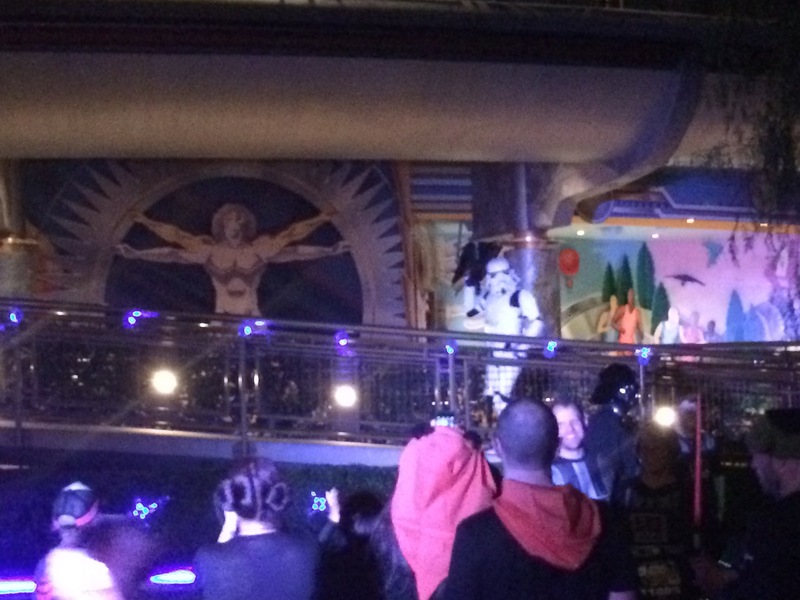 At Innoventions, Darth Vader was stationed with a few Storm Troopers keeping guard. Again, the lines were to a galaxy far, far, away. So, I quickly stopped and grabbed a couple pictures…hoping one of them would be worth posting on the blog. This is the best one. We passed Innoventions towards the Nemo Subs and then to the Matterhorn. From there we made our way back to It’s A Small World. Unfortunately, some of the holiday lights were not all lit up. Oh well. I couldn’t resist this selfie and then headed back stage. Pretty quickly after we got back stage, we ended the third mile. Another great mile for me…12 minutes, 13 seconds. We spent most of the 4th mile backstage at Disneyland. I was cruising along in the backstage area in the fourth mile when I had a bout with some dry heaves. It came out of nowhere. So, I skipped a run interval. Then, I tried running again. When I got to where this picture was taken, I had the second bout with the dry heaves. With all that happened with my wife the night before, I was a little worried here that I may have caught what she had. This is the spot where I decided to end my quest of a 10K PR and walk for a few minutes. By the time we got to DCA, I started feeling better and got back into the intervals. We made our way up Buena Vista Street and I stopped for what is becoming my traditional Disneyland Resort 10K picture spot. 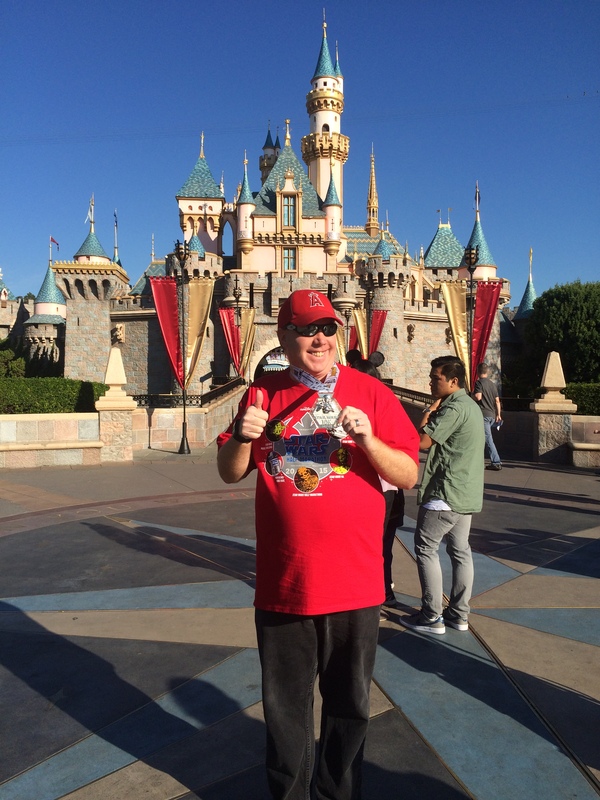 I’ve stopped here for each of the Disneyland 10K races I’ve run. So, I had to stop again. We continued on up past It’s A Bugs Land….past Cars Land towards the Paradise Pier area. Look who was there! Boba Fett! The line for Boba Fett was shorter than the previous Star Wars characters. However, it was still too long for me. One thing that I did not like about this spot is that the Disney cast members were pushing those of us who didn’t want to wait in line really far up the path to get our selfies. We headed up towards Ariel’s Grotto and I stopped for quick picture with Mickey’s Fun Wheel in the background. I really love this spot. Too bad the water had been drained. I missed the World of Color Fountains running on this weekend. 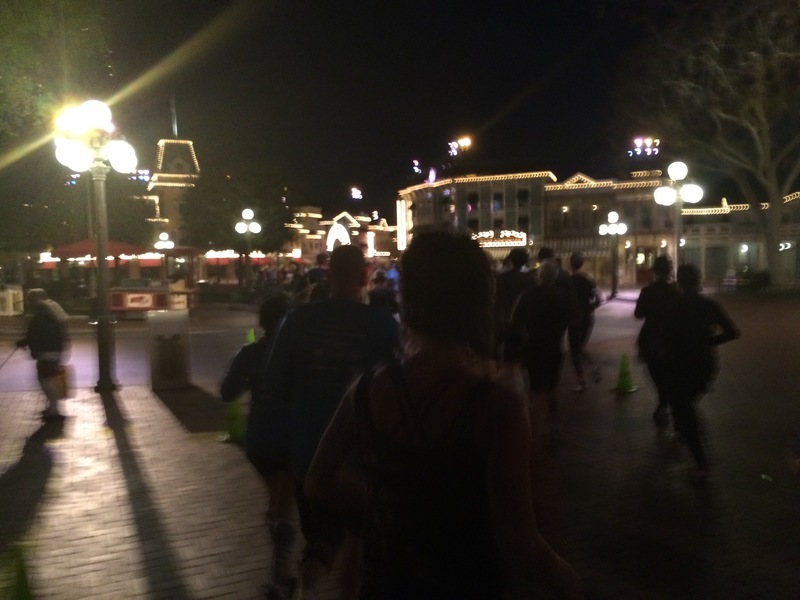 We ran the entirety of the Paradise Pier area and backstage at Disney California Adventure to finish out the fifth mile. 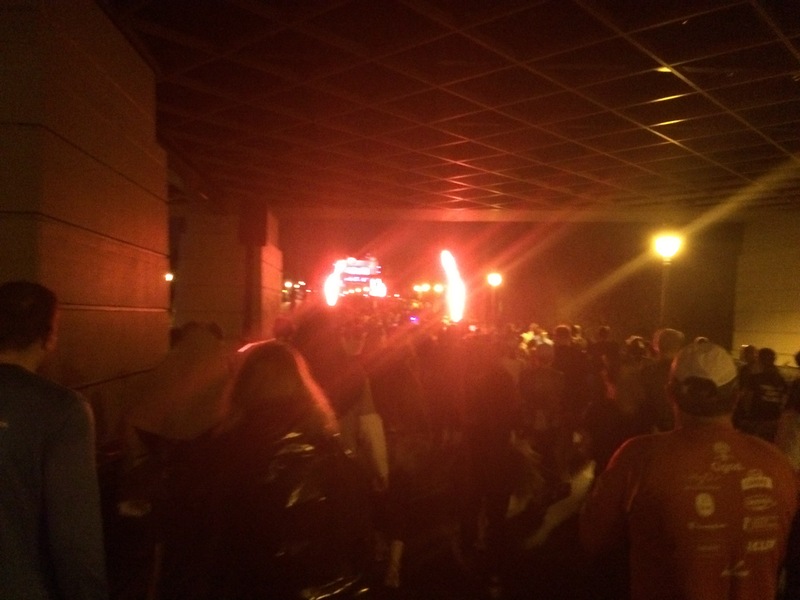 Towards the start of the sixth mile, we made our way back onstage and ran through Cars Land through this entrance. 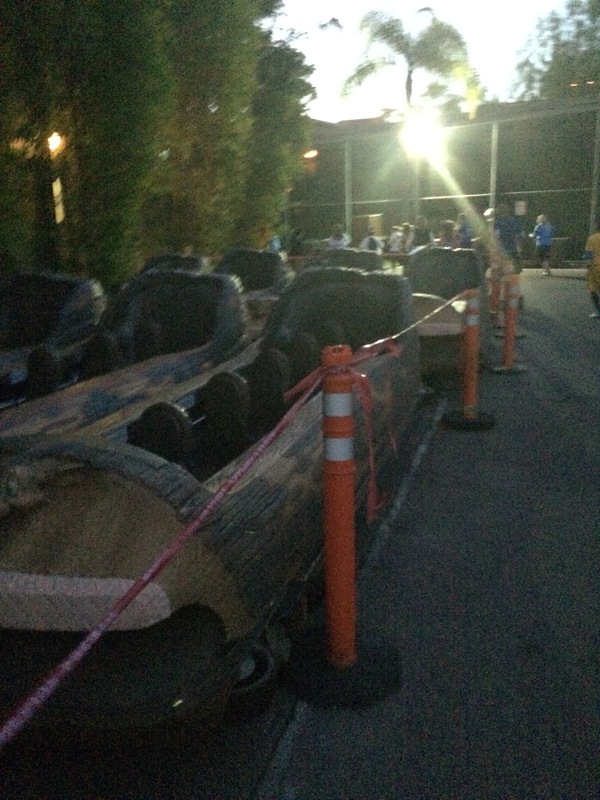 I love this idea for how to run through Cars Land! Maybe runDisney could have this route through Cars Land be for either the 10K or the Half Marathon and the run up Route 66 for the other. Hmmm. By the time we got here, I knew a 10K PR was out of the question. So, I took a few extra walk breaks because I was getting a little concerned with how the half marathon would turn out the next day. 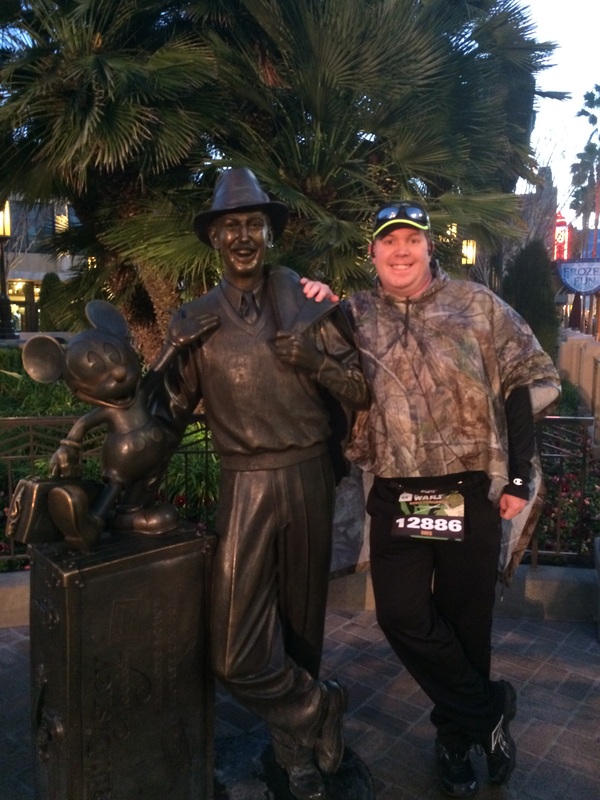 What was still in play, though, was a runDisney 10K PR. We came out of Cars Land and made our way backstage again at DCA. 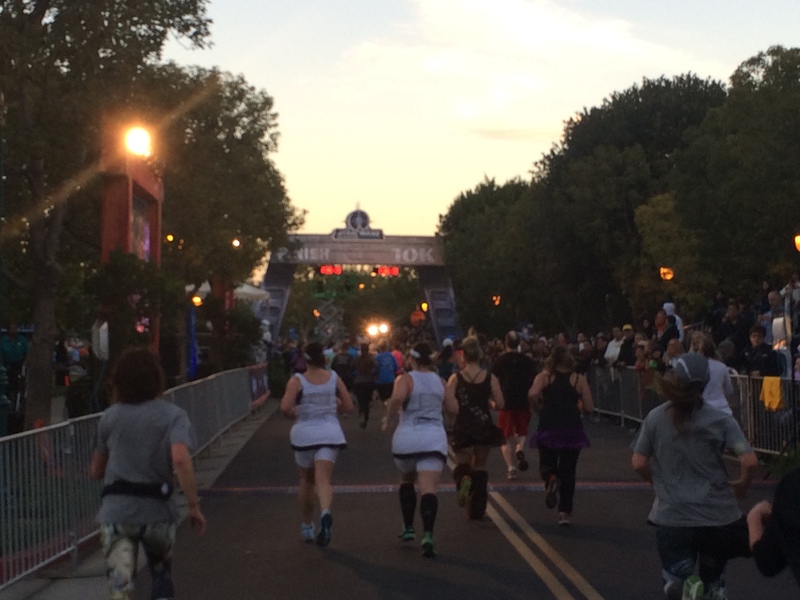 The rest of the course would be very familiar because it’s how the Disneyland Half Marathon and the Avengers Super Heroes Half Marathon ended. We came out of the backstage DCA and into the parking lot of the Paradise Pier Hotel. 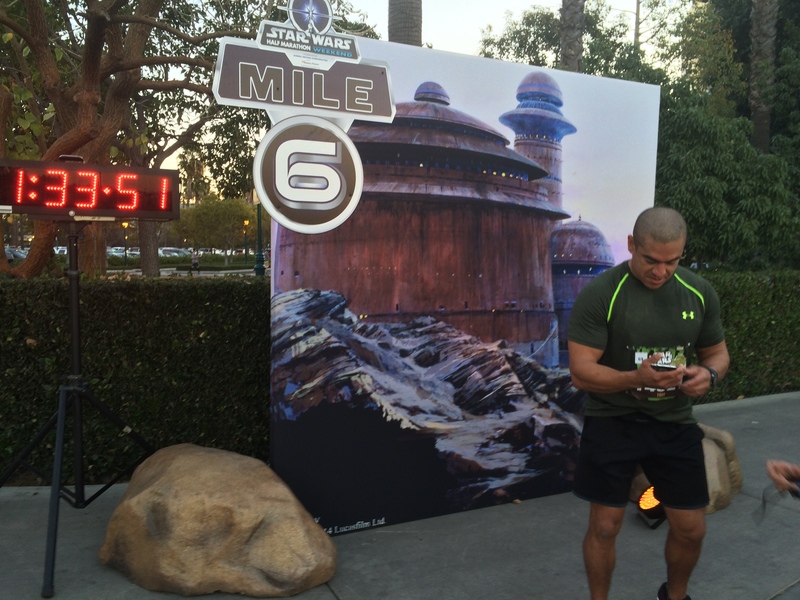 Right before we headed into Downtown Disney, we came to the 6 mile marker. 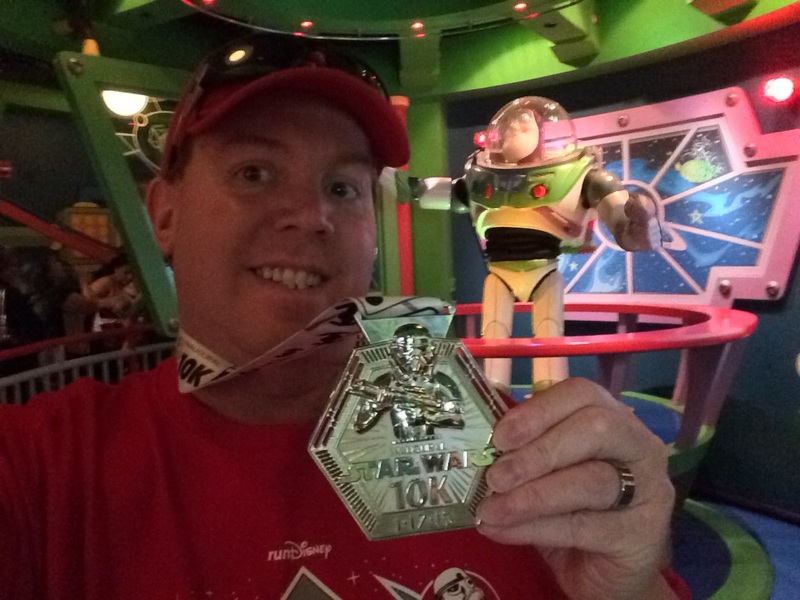 I could have walked the entire way to the finish line and set a new runDisney 10K PR! Since I had the half marathon the next day, I didn’t run as much as some of the others around me for the final 0.2 miles. However, the finish line was still pretty sweet to see! 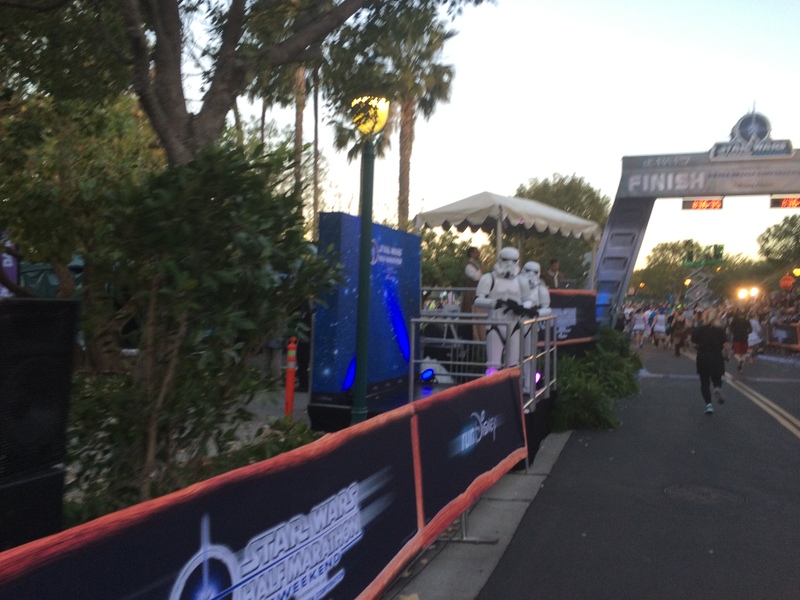 They even had Storm Troopers at the finish line. 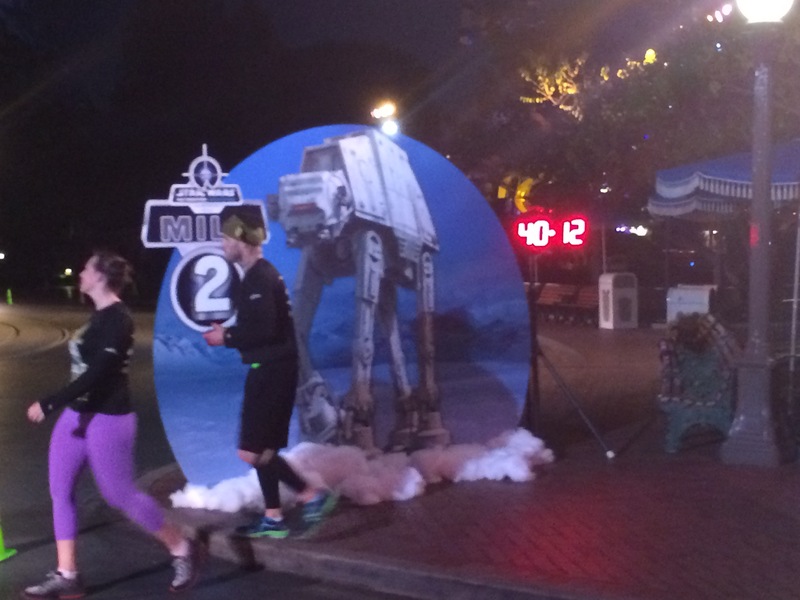 However, even the Storm Troopers couldn’t keep me from setting a runDisney 10K PR! Luke Skywalker had finished the first part of the Rebel Challenge! 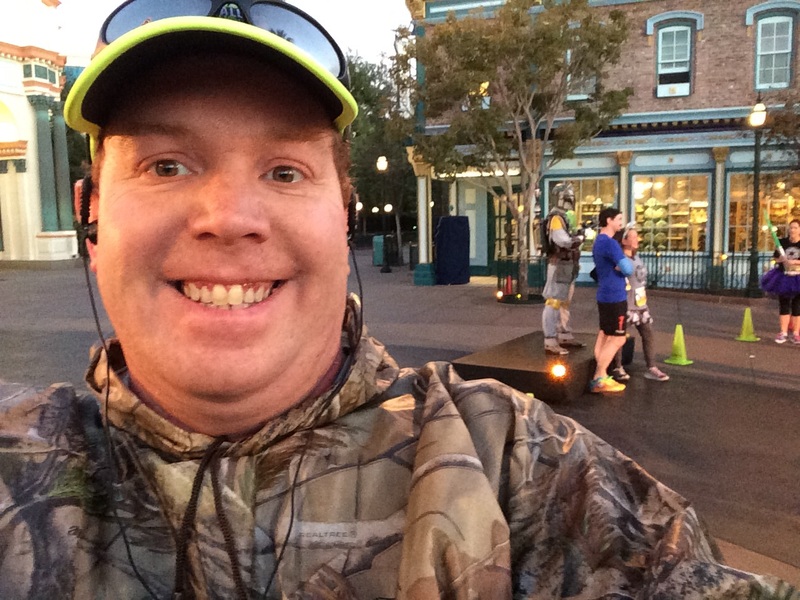 New runDisney 10K PR was set at 1 hour 22 minutes even! This was my third fastest 10K race overall! 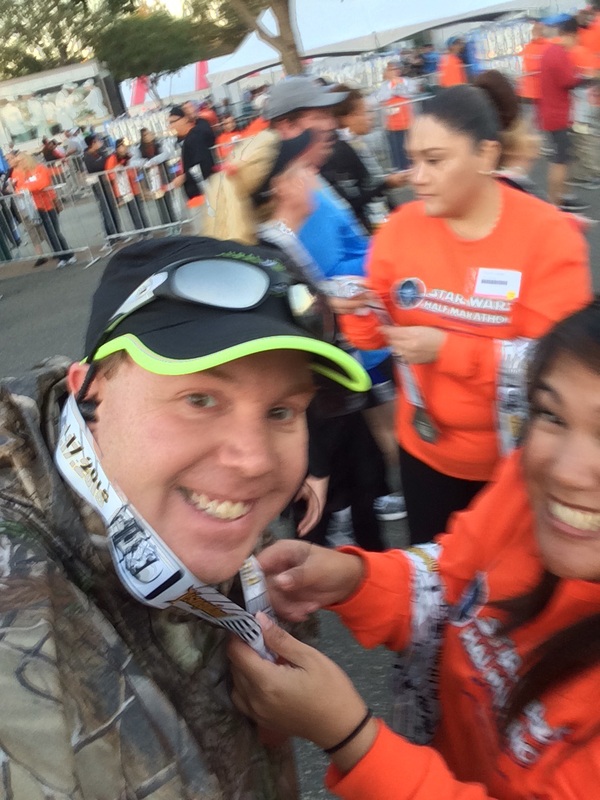 The volunteer who handed me my finishers medal thought it was funny that I wanted to grab a selfie of her giving me the medal. Afterwards, it was time to take the medal on a tour. From one Luke Skywalker to another. 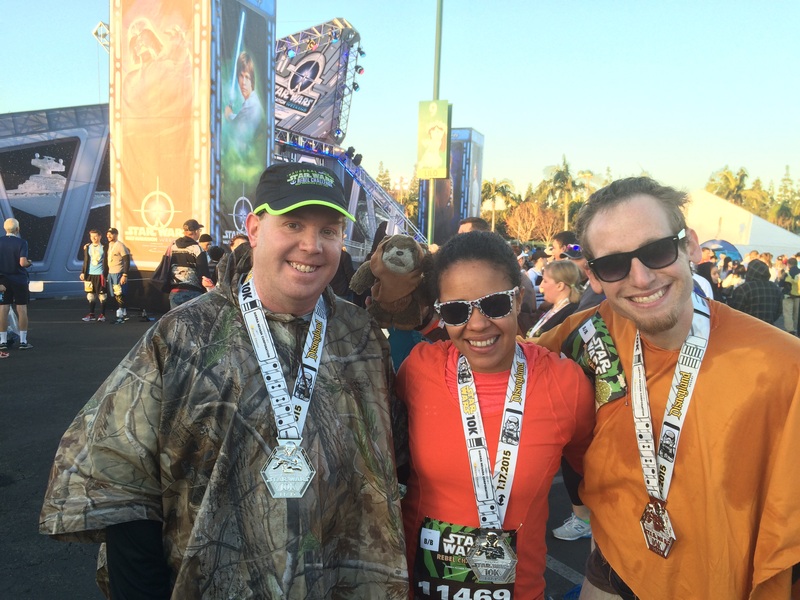 As I was getting set to leave, I ran into these guys…Juliana is a fellow Pasadena, runDisney lovin’, run blogger. She runs a lot of races with Devin. So, it was fun to run into them again at another runDisney race. Both Devin and Juliana had come back from Florida where they finished the Dopey Challenge (5K, 10K, Half Marathon, and Full Marathon in 4 consecutive days). They were both running the Star Wars Rebel Challenge this weekend like me. After a quick trip to the hotel room to check on my wife and a shower, I headed off to the theme parks for some pictures with my new piece of runDisney bling. 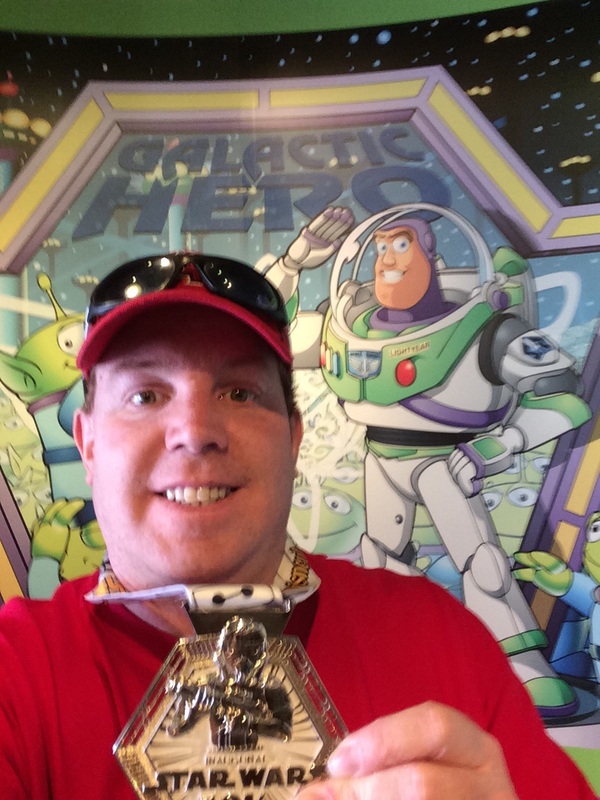 Buzz Lightyear was quite impressed with my new runDisney PR! All in all, it was a fantastic race course. I loved that all the climbs were in the first mile and a half! I loved all the Star Wars characters they had on the course. 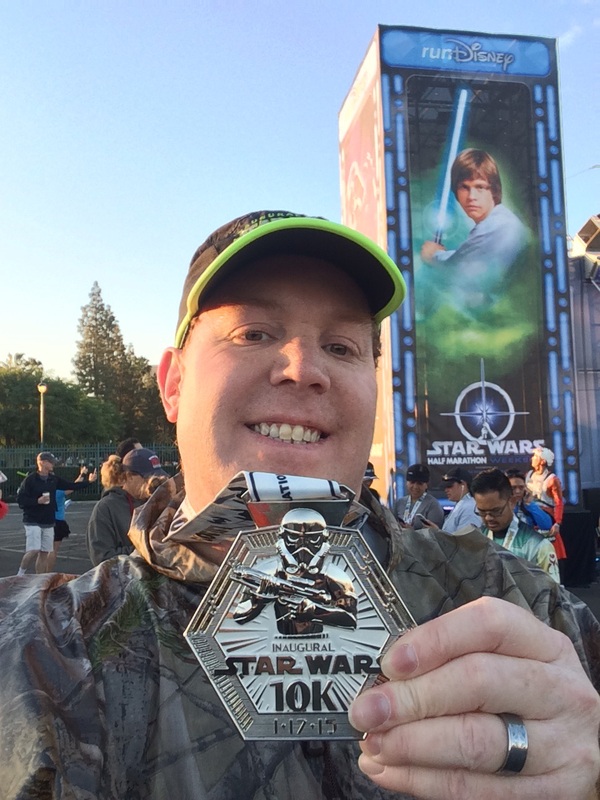 The Star Wars 10K medal was the best of the bunch. 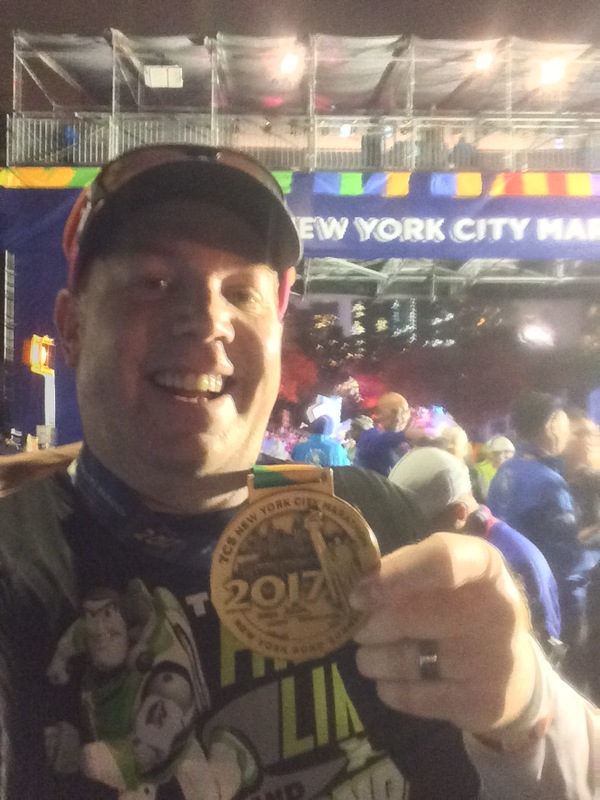 I will most definitely be back next year for this race and could see myself running this race for many years to come (assuming runDisney offers it). 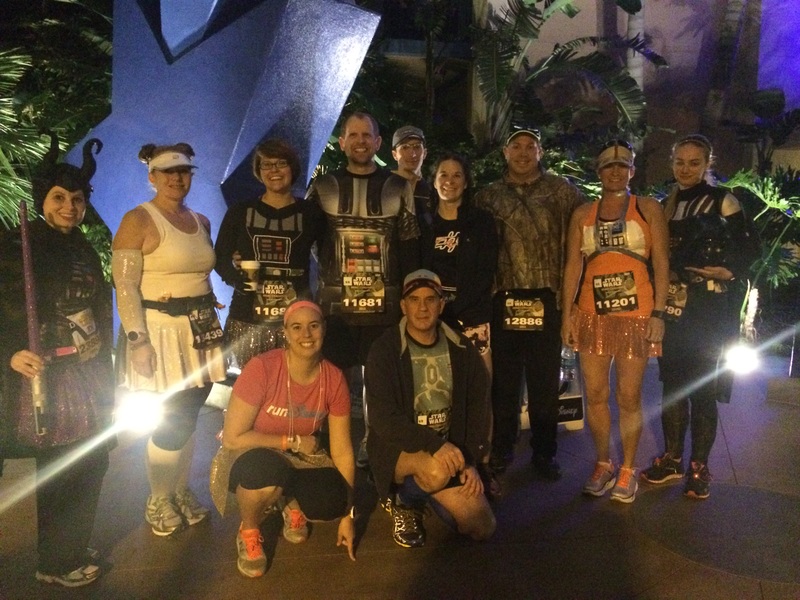 It was fun running in a costume (Luke Skywalker from Endor). However, after seeing all the amazing costumes for this race, I want to seriously up my game costume wise next year. I loved the 10K course! It was super fun and I agree, the Vader breath in the tunnel was a nice touch. I also enjoyed that every mile marker was a different back drop so you could stage your own photo. I agree. 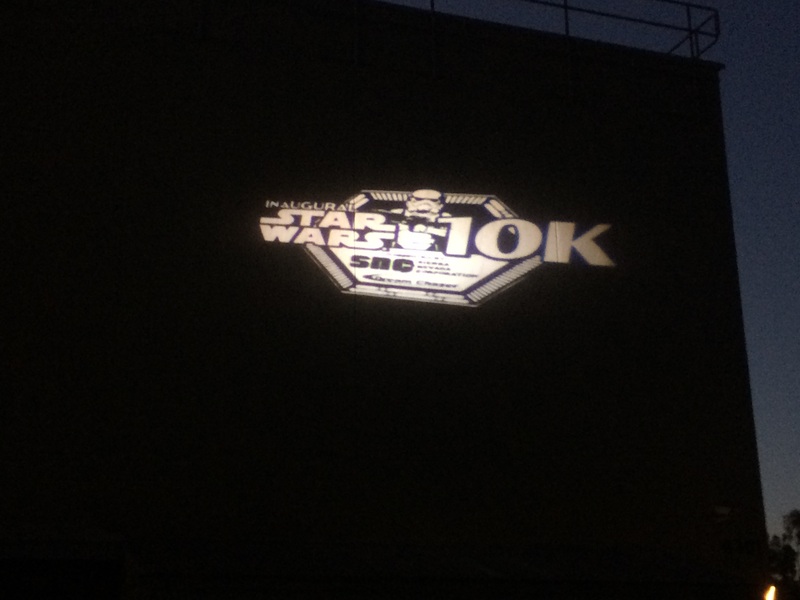 The backdrops for the 10K were so much fun! I wish I had time to stop and get photos with each one. Indecisiveness over whether to aim for a PR or run for fun cost me the opportunity for some fun photos. Oh well…Next Year! I loved the Darth Vader sounds in the tunnel! Me too! It was so unexpected during the 10K! What an awesome report. I didn’t realize I had had a brush with fame when I helped you take the picture at DPP. Glad you enjoyed the run! That was you? Awesome! Thanks for taking the picture! While I liked the Darth Vader sounds in the tunnel, I hated the flashing lights. It made me a bit light headed in both the 10k & half. Oh no! Sorry to hear that. The flashing lights didn’t have that effect on me. However, I’m sure that you weren’t alone in the effect it had on you. Always fun running into you and Devin!